Good morning my friends! It’s a brand new week and so far it’s shaping up beautifully. The kiddos are back in school (whew! ), we’ve got an extra hour in the day, and the sun is shining. And I have creme brulee! Not just any creme brulee either. This one is rich and creamy, with toasty warm coffee flavors and a boozy kick. If you like to drink Irish coffee then this dessert has your name all over it. Creme brulee may sound fancy and French but I promise you it’s one of the quickest and easiest desserts you’ll ever make. I whipped this up in less than 10 minutes on Sunday afternoon, and then I was out the door. Mr. Allie babysat the oven for me and took them out as soon as they were set. A quick chill in the fridge and they were ready in plenty of time for dinner. And the flavor payoff is HUGE! So silky and comforting, and that crackly burnt sugar topping is a perfect compliment to the deep, roasty flavors of coffee and Irish whiskey. I have done some scientific experiments and come to the conclusion that when it comes to creme brulee, more sugar on top = better. I don’t want no thin, skimpy crust on my creme brulee. I want big, crunchy shards of caramel-y goodness. What you see in the pics here was a little lacking, for my tastes. I recommend topping with about a tablespoon of sugar. Just drop it on the surface, and shake your ramekin around to even out the layer. If you don’t have a brulee torch you can just pop ’em under the broiler for a few minutes. Just keep a close eye on them- sugar goes from caramelized to burnt in the blink of an eye. These are a fun and delicious dessert for St. Patrick’s Day, or any day, really! Whip up a batch- they’re a perfect after-dinner treat! Cool, creamy Creme Brulee gets a boozy kick from Irish Whiskey, and rich flavor from toasty Coffee. It's your favorite St. Patrick's Day drink, in Dessert form! Make this Easy Recipe for St. Patrick's Day, or any day! Preheat the oven to 300 degrees F and line a baking dish with a clean kitchen towel. Set ramekins on top. Place the yolks in a mixing bowl, along with the sugar and salt. Whisk together until combined. Heat the cream in a small pot until simmering. Slowly add the hot cream to the egg yolk mixture, while whisking. Stir in the coffee, whiskey, and vanilla. Transfer the mixture to the ramekins and carefully fill the larger baking dish with very hot water, about 1 inch up the sides of the ramekins. Bake for 40 minutes, or until just barely set in the middle. Cool completely, then top each ramekin with 1 tablespoon of sugar and brulee with a torch or under the broiler. Allie, I love this!!!! A boozy creme brulee is just what I want!!!! and this is why I need a chef’s torch. . this is like the only kitchen tool I don’t have. . because I don’t trust myself sticking these under the broiler. . love this recipe!!! This is the perfect lunch! 🙂 I love creme brulee and love even more that you boozed it up. I have two torches and they scare the bejesus out of me so I’ve never used them. I think this is the recipe I’ll have to break, at least, one of them in with. Don’t let them freak you out! They can smell your fear 😉 Seriously if you can use a gas stove, a brulee torch is nothing to be scared of. Just stay away from the business end and you’re all good. Thanks so much Kellie! I love creme brulee and I love Irish coffee, what a perfect dessert for me and that crunchy top is to die for. Oh my goodness! Love. What perfect flavors. Have a great Tuesday friend! Thanks so much Melanie! And thanks for sharing on Pinterest too. Hope you’re having a great week hon! Yes! I know- I can’t live without my morning coffee! And my after-dinner Irish coffee 😉 Thanks so much Miss! Girl you gotta get brulee-ing! Don’t let that fabulous kitchen gadget go to waste! ;P I bet you could come up with some great beer-inspired creme brulee recipes and pairings. Good luck and enjoy! And thanks for the pin! Your creme brulee is gorgeous, Allie! I love that thick sugary crust over the top. This is so perfect! Thanks so much Jen! Isn’t creme brulee just one of the greatest inventions ever??? Seriously, wow! You knocked it out of the ballpark with this one! I am adding all of the ingredients to my grocery list– I am definitely making this for sure! Thanks for a wonderful recipe, Allie! That’s so funny Linda because I actually did end up eating this for lunch! I’m so glad you like it sweetie and thank you so much for commenting! Wow, your creme brulee looks absolutely delicious! I don’t want no skimpy topping either! Bugger that off – it’s the best part of creme brûlée! Love that you made this into a grown up version. Means you don’t have to share with kids!! He he! My Irish eyes are smiling about this! OK, so I’m not really Irish, but I am by marriage, lol Pinned to try this for sure! 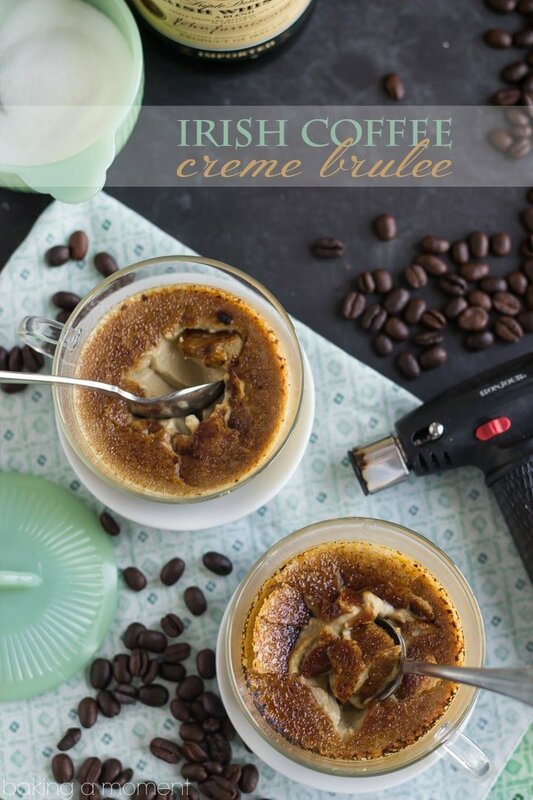 Love Irish coffee and the idea of this creme brûlée is brilliant. Pinned to try it! Glad you are having a nice week Allie, I’m so happy we got some sunshine, too! Hooray! It’s really starting to look like Spring, right? So glad you are getting some sunshine too. Have a great day Mira and thank you so much for pinning! Haha! I made 2 big servings too and ate most of it 😛 I hope you enjoy Kelli! Oh and ps if you want to leave out the coffee you can- just substitute with more cream. Good luck and thanks for reading! Sounds DELISH! I love coffee in my dessert! Rich and creamy. Totally making this! Thanks for sharing. My pleasure Lokness! Thanks so much for the awesome feedback- and I hope you enjoy! Yes, love that crunchy topping!! You’re my dessert hero, Allie. This looks so good! Allie, these look delicious! I agree – the more crunchy, caramelized sugar on top, the better. I’ve wanted to buy a mini-torch for so long, but I try to keep my kitchen clutter down to a minimum (I find cookie cutters to be the one item I just keep buying and buying 🙂 I think I need to make more creme brûlée to justify a torch. I think I’ll start with this one! I love your Irish inspired creme brulee Allie! I don’t really like whiskey but I can imagine that I can use Bailey’s for this? Absolutely Thalia! Or any other kind of spirit or liqueur would work as well. Thanks for the great question! Yay for the sun and warmer weather 🙂 Love this boozy creme brulee! The loaded crunchy top looks perfect! Thanks Kelly! We loved the way the flavors worked together. Hope things are warming up out your way! Thank you sweetie! The cups are from Ikea- like $2 a pop! I’m digging the irish coffee! Cool and creamy sounds perfect right now – we even have warm weather to justify thirds on this! You are rocking the crème brulee Allie, and that’s not easy, they’re suckers to photograph. Absolutely stunning photography per usual. Pinned! Ugh, girl you know it! They are sooo hard to photograph and I was almost kicking myself for choosing to do this- until I took a bite, haha! They are sooo stinkin’ good! Thank you so much for the sweet compliments Mary Frances! My pleasure Laura! Creme brulee is one of my favorite things to make and eat! This looks so so delicious! Pass me a bowl please! Thanks Manali! Hope you’re having a great night sweetie! I recently bought a torch and simply must make this!!! OMG it is spectacular Allie. I just bought a brulee torch and now I know what I want to make with it. 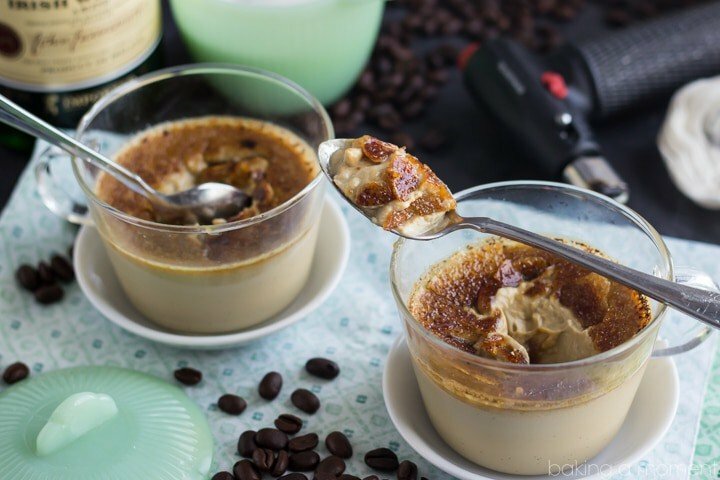 Your Irish coffee flavoured creme brulee looks amazing, Allie! You can’t go wrong with boozy coffee! Girl, these are insane! I’m not sure I could love them more! We finally just got a new kitchen torch and you’ve inspired me to get on making something with it. These are so perfect! Amazing!!! 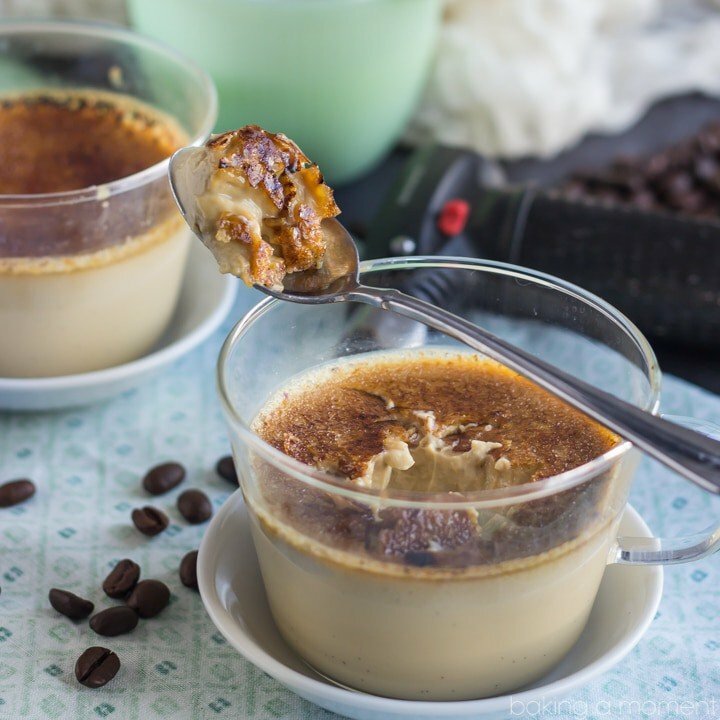 Pingback: Irish Coffee Creme Brulee – Hello, it's Audie! A humble thanks from me to you for this great recipe. Because by using this recipe I give a surprise gift to my parent’s marriage anniversary morning and got lots of accolade from my family members. 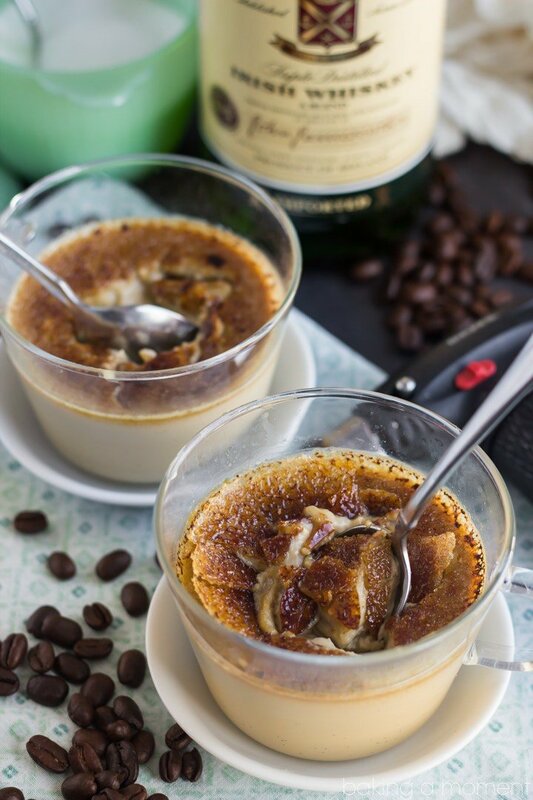 here I’m using the espresso shot from my personal home espresso machine to making this Irish Coffee Creme Brulee. Sounds fantastic Rayyan! Happy anniversary to your parents and thanks so much for the good feedback!